Francis Ngannou has relocated back to Las Vegas for his training camp to get ready for his upcoming fight against Derrick Lewis at UFC 226. Francis Ngannou is back in Las Vegas as he prepares for his UFC 226 showdown against Derrick Lewis. The hard-hitting Cameroonian relocated to Las Vegas last year as he prepared for his UFC 218 fight against Francis Ngannou that resulted in a stunning first round knockout. At the time, Ngannou was primarily training out of the UFC Performance Institute before bringing in his coach Fernand Lopez from France to help him prepare during the final weeks before the fight. Now it appears Ngannou is back in Las Vegas as he gets ready to fight there at UFC 226 while training at both Xtreme Couture and Syndicate MMA. Syndicate MMA head coach John Wood revealed some footage on Twitter of his pad session with Ngannou just recently. Ngannou is also sparring at Xtreme Couture where they have a long list of heavyweights including new UFC signee Blagoy Ivanov, who has his own fight coming up in July against former champion Junior dos Santos. Xtreme Couture also boasts coach Ray Sefo, who is a heavyweight and a former kickboxing world champion as well. This appears to be Ngannou’s new set up ahead of his next fight against Lewis after training primarily in France ahead of his title match against heavyweight champion Stipe Miocic in January. 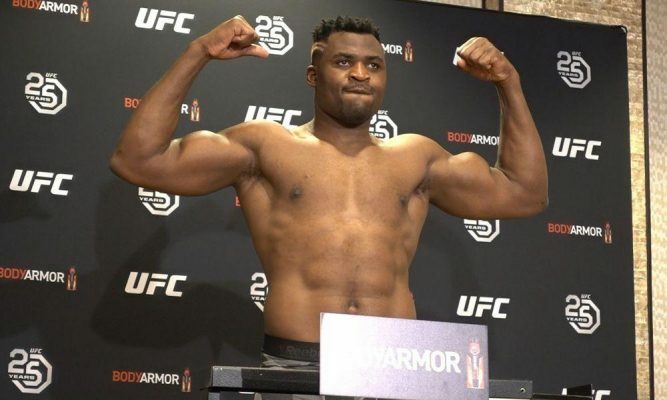 Ngannou had explained that due to the quick turn around between his knockout against Overeem in December 2017 and his fight against Miocic in January 2018 that he would return home to France for his training camp. Ngannou has now returned to the United States where it seems he will spend his entire training camp for the fight with Lewis in July.